When I sift through a series of foggy memories from the past year, I can vaguely recall mothers of toddler aged quadruplets saying it was much more taxing than the infant stage. New quad moms, I hate to break this to you, but this is the truth. Even though the quads are fantastic sleepers (sleeping 11-12 hours solidly most nights), George and I are far more exhausted than in the days of round the clock feedings. I believe it’s because they are incredibly curious and require far more cognitive energy from us than in the past. Many aspects of our life are “easier”. Most parents, especially parents of multiples would probably agree that it’s never “easier”, just different with each stage. We certainly don’t miss making bottles, late night wakings, reflux, or colic. Right now, the little personalities that are unfolding are precious, and the learning that takes place on a daily basis is impressive to say the least. Right before our eyes, our babies are transforming into little people with their own thoughts and opinions, which they often assert. After everyone is snugly tucked into bed, George and I muster just enough energy to complete the most necessary of chores before we settle in for the night. We have absolutely no trouble falling asleep at night. That’s quaddlerhood! With the help of a our dutiful friend, Terri, we took the quads for their 18 month well check on Monday. They all got a clean bill of health, which we never take for granted. Oh how far they’ve come since their NICU stint. Not surprisingly, they are all somewhat tiny, however. It may be partially due to prematurity, and partially due to the fact that they have small parents. My mom kept impeccable records in my baby book so I did a comparison. I was EXACTLY Rylin’s height and weight at 18 months! While I believe George and I are simply surviving at the moment, the quads are thankfully thriving. Sydney is the only one who still receives Early Childhood Intervention Services, but she’s made enormous gains recently and will likely be dismissed by age two if not sooner. Because the blog also serves as a baby book, I included an extensive update on what everyone is doing. Feel free to skim it, or skip it altogether and enjoy the video at the end instead. Social/ Emotional: Rylin tends to take time to “warm up” to new faces, but in time she jabbers to most anyone who will listen. She names each of her siblings, Nisey, Poppa (she got naming rights to “Grandpa” by being the first to use his name), and Aunt CiCi. She thrives on individual attention and really enjoys “conversations.”, sometimes jabbering away to her siblings. She enjoys giving hugs and kisses, especially to her siblings and sometimes the dogs. Cognitive: Rylin names a few colors: pink, purple, green, and blue. When asked, she points to pictures in books and/ or labels them. She also labels and points to body parts including: eyes, nose, ears, head, tummy, belly button, feet, hands, eyebrows, chin and cheeks. Rylin is able to engage in pretend play; she likes wearing her dress up tutu and tending to her “babies”. She’s not much of chef, but doles out baby bottles and blankies rather well. Fine Motor: Although she very much enjoys snacking on crayons, Rylin can scribble independently. She also turns pages of a book, opens and closes containers, and zips/ unzips. In fact, she is one reason we stopped using sleep sacks- she unzipped them. Gross Motor: Rylin climbs up stairs with ease, and skillfully backs down them. She also climbs our toddler slide then turns around to go on her tummy, feet first. Of the four, Rylin most enjoys jumping on our mini trampoline. She also enjoys riding toys of all types. Communication: Rylin voraciously learns new vocabulary words on a daily basis, and incorporates them into “conversations”. We keep a word list for each baby, but we’ve lost track of hers since she knows over 50 words. Since she soaks up new words easily, we have to be very careful what we say because she will imitate anything she hears, and also gets her feelings hurt if she thinks we are saying something mean about her. Not only does Rylin have many words in her vocabulary, she uses them to make requests and puts 2-3 words together such as “Oh no!” When Rylin is upset, we find that asking her to follow simple directions distracts her and makes her feel a sense of pride. She’s very good at finding and bringing things to us, which is helpful. Social/ Emotional: Harper tends to be most mellow around new faces and greets anyone without hesitation. Despite his reputation for being a crocodile, he’s beginning to enjoy more time sitting in our laps for snuggles. When asked, he will give hugs and kisses. He names his siblings, calling Mason, “May May” as well as himself. Cognitive: Harper is excellent at problem solving and enjoys shape sorters and form puzzles. He’s proven himself capable of matching shapes to like colors and fitting up to eight shapes into a puzzle. Harper also loves imaginary play. 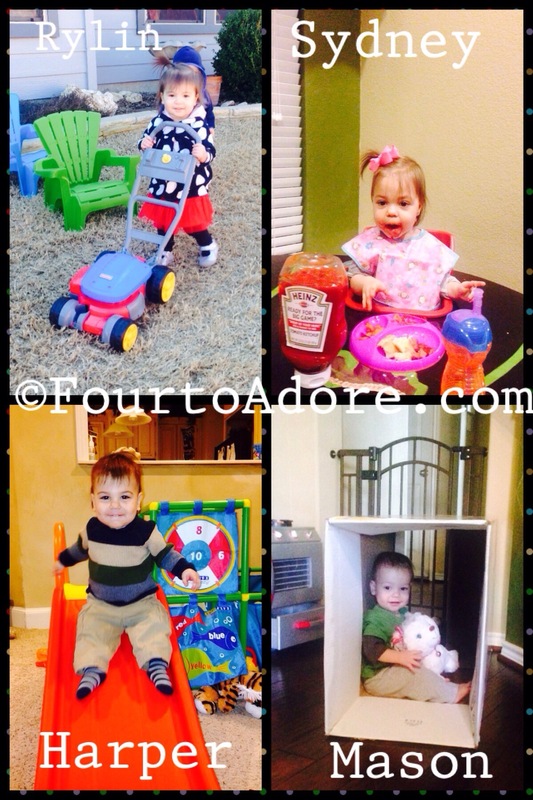 He continues to love whipping up concoctions in the play kitchen and feeding baby dolls and animals alike. Fine Motor: Harper loves to open and close anything. We often give him empty food containers before we recycle because he enjoys opening and closing so much. He’s very close to manipulating one of our baby gates so we have to keep an eye on him. Coloring is not his favorite task, but he is able to scribble. He was the first to take spoons from us to feed himself. He is becoming better at eating with utensils and gets about half of the food from a fork into his mouth. Gross Motor: Harper was the first to climb stairs independently. We figured out he could do it when he was missing one afternoon. Someone forgot to latch the baby gate and Harper enjoyed exploring upstairs on his own. Terrified us! He was also first to master the toddler slide, and he literally goes into a trance going up and down repeatedly until we stop him. Recently, he began slowing himself down with his feet then doing a bit of a dismount. He’s also a huge fan of riding toys, particularly the bouncing zebra and motorcycle. Communication: While Harper is typically quiet, he has 25-30 words in his vocabulary as well as many animal sounds/ signs and environmental noises. He is beginning to use his words to make requests, especially with encouragement. We often see him signing “please” as he says, “more, more, more”. He identifies several body parts including: eyes, nose, mouth, head, feet, belly button, and ears. Additionally, Harper is beginning to follow one step verbal directions (e.g. put this in the hamper). He’s so proud of himself when he’s done something requested of him. Social/ Emotional: Of the four, Sydney is always the first one to greet Mommy and Daddy after work. She literally sneaks into the den where she stands at the gate exclaiming, “Mommy” or “Daddy”! It melts our hearts every single time. While Sydney is our most introverted child who loves “me time”, she is beginning to play with her siblings, especially with games of chase. She is also our most compassionate with animals. She gravitates towards the dogs and is always extremely gentle with them, lightly stroking their fur. She’s also been caught curling up in Lily’s bed numerous times. Cognitive: As of today, Sydney engages in pretend play. During specialized skills therapy, she talked on a toy phone and fed her puppy. She responds really well to music and often hums familiar tunes. She shocked me one day when she sang a few lines of the Alphabet Song since we hadn’t officially introduced it. Apparently she picked it up from one of the many toys that play the Alphabet Song. She’s also really good at matching tone and pitch she hears. Fine Motor: As with the dogs, Syndey is delicate with books. She is the only one to be trusted with non-board books as she carefully turns pages and studies each one. Sydney can scribble with crayons, but is generally unimpressed with this activity. Gross Motor: Sydney recently surprised me when she climbed up stairs as if she’d been doing it for years. All the while she proclaimed, “Up! Up! Up!” She was the last to walk, but is certainly working hard to catch up to her siblings. Shes most skilled at getting and out of toddler sized chairs and loves testing the limits by standing on them. Sydney often bends over and attempts somersaults. She cannot do them independently yet, but with help she squeals in delight. Communication: Thanks to speech therapy, Sydney’s vocabulary is developing steadily. Similar to Harper, she’s often quiet and choosy about when she wants to speak. However, she has about 25-30 words in her repertoire.She also knows many environmental sounds, especially animal sounds. With prompting, she can make simple requests using baby signs including, “drink, more, please, and cereal”. I honestly believe she may have more than we know, but she often speaks in whispery tones so I don’t know that we hear her over her siblings commotion. One of her therapists is trying to help her assert herself, especially when it comes to siblings. Social/ Emotional: Mason is our social butterfly. He does not know a stranger (I anticipate lots of “Stranger Danger” education in his future). He continues to charm people with his huge smile and double dimples. Mason is extremely affectionate and often hugs and kisses his siblings as well as caretakers. He calls himself “May May” and names all three of his siblings as well as Nisey and Poppa. Mason initiates play with his siblings and gets a thrill out of tag. Cognitive: Although he’s not consistent, Mason generally identifies the following colors: red, orange, green, and blue. He also labels heart and oval shapes. Like Harper, Mason really enjoys dramatic play in the kitchen and is always mixing up something. He prefers to find two toys that match so he can keep one in each hand. Recently, we’ve noticed that he manipulates the Little People toys within their scenes (e.g. putting a doll on a slide). He labels and identifies the following body parts: eyes, ears, nose, eyebrows, tummy, belly button, feet, and hands. Fine Motor: Mason seems to be most interested in mastering fine motor skills. He brushes his teeth rather well with a side to side motion, and manages utensils well. In fact, he becomes upset if we don’t give him a utensil at meals if the food is not clearly a finger food. He scribbles with crayons, of course snacking on them too. Mason is beginning to sort shapes and complete form puzzles. Additionally, he manages zippers and is able to remove his clothing. Gross Motor: Mason climbs upstairs and the toddler slide with ease, however he is fearful to come back down independently. He enjoys riding toys and jumping on the mini trampoline. Of the bunch, he is the only one who kicks a ball. Communication: Mason has bout 35-40 words in his vocabulary as well as many environmental sounds and baby signs. Like Rylin, Mason desires to learn new words and picks up new ones often. He makes his needs and wants known, often saying “help” or “please”. He does a good job of generalizing new words learned from books and conversations by labeling objects in his environment. Do you know how big you were at this age? Wow, I just can’t quite imagine 🙂 I have only one kiddo so blogs like yours (and Rebecca Ishum’s) are just fascinating to me. I’m also amazed at smaller kids. My boy was 22 inches tall when he was BORN!!! He was 20 pounds by 6 months and 32.5 inches tall by 1 year old. He has always been a big old boy. Thanks for sharing your interesting story. A friend of mine has a four month old about the same size as my smallest two. We both have outliers. It sounds like your boy was the same way. That’s true. They never gave us a percentile on height, only said “off the charts.” Weight was 90th percentile as well. He has slimmed out but is still very tall, broad and athletic. Makes me wonder how tall he will be. Haha, mine are “almost on the charts”. I just hope they aren’t super short as adults. I’m petite, but exactly average height at 5′ 4″. You may have a tall fellow! Wow, they’re getting so big! I love the video, too cute. I can’t even imagine how you & George have the energy to manage every day! I think its amazing you guys have documented so much about who they are becoming. I knew you guys would be amazing parents. I am just so happy for y’all and appreciate the example and advice you guys share. Thank you for the compliments! It’s our pleasure to share the experience with you. I sure hope someone benefits from our muddling. That warms my heart! Thanks for keeping up with us :). We are still working on thank you notes from x mas….they love the little people stuff. We truly appreciate the continued prayer. I often seek calm, patience, grace, and wisdom. I hope you will be able to come again sometime! As always, I love reading your blog and look for your tried and true mommy tips to help me with my 6 month old twins! (I’ve been referring to your “make your own wipes” recipe recently and trying to convince my husband to do it!) Your babies have come such a long way. In terms of your babies’ growth, it seems like they are all doing so well. My twins were born at 35 weeks and though my daughter had a 2 week NICU stay, they are both doing very well. My son is the spitting image of his father and at 6 months is 21 pounds. I believe he is going to be a giant boy, and he’s come a long way since coming home from the hospital at 5 pounds. My daughter is 17 pounds and doing well too. Genetics play a big role. My real reason for my comment though, is in reference to using Baby Sign Language. I know it’s something you do and it’s been successful for your kids. I have just started (in the last week) trying a few signs with my twins (eat, more, and all done), but I want to make sure I know what I’m doing. Okay, I think I posted a half response to this. Sorry! First of all, thank you soooooo much for keeping up with us. I sometimes pop in on your blog to see how the twinkies are doing, but the quads do their best to make sure I don’t read as many blogs as I’d like. I remember you from the Infertility Sisterhood =) It always makes me happy to know others benefit from our experience. I cannot tell you how much I love DIY wipes! Give it a go =) You won’t regret it. Even if you hate them, they are super cheap to make. I totally agree, genetics likely play a major role in growth and adult size. At birth, Harper only weighed 3 oz more than Mason, and now Harper outweighs his brother by 6 lbs. They’ve had the same opportunities, but have very different body shapes. I’m tiny, and George is average so it would be a surprise if our kids were big. I’m so happy your two are growing and thriving. 6 months is a really fun age. Let the spoon feeds commence! Oh, baby signs are fantastic! I started with “more” when the babies began clapping since it’s pretty much the same motion. Don’t overt hink it. In fact, you can make signs be whatever you assign them to be as long as you and the babies are consistent with each other. I haven’t written a post about it, but I think it’s a great idea! I’m sure you aren’t the only one who would like to know about BSL. I’ll stew on it a bit and see if I can come up with something mommy friendly. Thank you so much for all the information! I will look into those books! You’re doing a great job! Congrats on the 18 month milestone. They are precious! But so true, it’s never “easy”, just different. I do suspect toddler and teen years to be most difficult though. Great stats – love hearing how everyone’s doing, but the best is seeing them in action at our play dates! And girrrlllllll, at least we can be tired together. Whew. I is always a comfort to be in good company!!! We need to schedule another pm play date, maybe with both grandmas this time. I love how they are starting to interact with each other. Love it!!! This age is so fun and exhausting!! I don’t know if I have ever heard you voice! In my head I thought I knew exactly what you sounded like. So funny how we create that in our heads. I can’t wait for all of us to meet in real life since we literally talk to each other every single day. Haha, that’s so funny! I hate hearing my voice on recordings so I often edit so you don’t hear it ;). It’s so crazy how close knit we all are yet haven’t met in person. Just found your blog from game of diapers. Love it! You really helped put things into perspective for me as a mother of three, one being under one. Thank you for stopping by, and taking time to comment. I love hearing from readers! Sometimes it’s so hard to see the forest for the trees when we are in the thick of things, isn’t it? Hi Cate, Thank you so much for reading, and taking time to comment. I especially love complimentary words! We are very grateful for the early intervention therapists who helped us meet so many milestones. I just stumbled across your blog a few weeks ago and I love it! I am amazed at how you keep track of so many details about each child. They are doing so unbelievably well! It was so nice to read this post. Our will be 18 months in a week. The girls are still afraid/not ready to walk yet. I am just tired and they require so much attention and they are LOUD! And I thought I might not be on the right track but it seems like you and George went through this too. I try hard to keep up with everything (house chores, cooking and of course my main attention is on them) but I feel like I am behind with everything. I feel like I am not enough and that breaks my heart. Love reading your blog, every time I get a chance. I feel like I have a real friend… that I never met. Aww, girl! I’m in the trenches with you. I think you entered real toddlerhood. In many ways it’s easier than a year ago because they are able to be more independent. Yet, I still struggle just like you to care for them and maintain. I often wonder if this “survival mode” is actually permanent. Know you are enough, you are doing a good job, and you’re never alone. I hope we can meet in person someday! Do your kids get early intervention? The girls are, they started a year ago and doing good. Our PT is happy with them. Yes, total survive mode in our house too! That’s great! I’m sure walking is on the horizon and PT is helping them get closer to it.